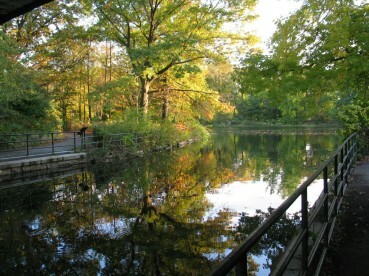 Brooklyn is as proud of its Prospect Park as Manhattanites boast of Central Park. A perfect comparison—Olmstead & Vaux created both with equal pride. Each park defines the heart of its borough. No matter the season, your visit will be called, “remarkable.” Its 526 acres (213 ha) touch on five distinct and historic neighborhoods. Highlights within the park: the Long Meadow, 90-acres (36 ha) of green; Litchfield Villa, the elegant home of Edwin Clark Litchfield. The Boathouse, housing a visitor’s center and the first urban Audubon Center, is remarkable. The serenity of the lake—Brooklyn’s only lake–covering 60 acres (24 ha), draws runners and strollers, families and lovers all year, while the Bandshell hosts free outdoor concerts in the summertime. The private Society of Friends cemetery on Quaker Hill is where actor Montgomery Clift is interred. Happier to note, the carousel spins from early April to mid-November. Within the park is the Prospect Park Zoo, another NYC proud member of the Wildlife Conservation Society (as are the Bronx and Central Park zoos). The zoo was, in past times, almost an “afterthought,” but today it ranks among the best in the nation. Its animal population and special exhibits are always of exceptional quality and care, so far beyond “The Menagerie,” opened in 1890 as a Victorian age curiosity. Just minutes away; if you’re searching for hotels near Prospect Park, make our Brooklyn Hotel your choice.